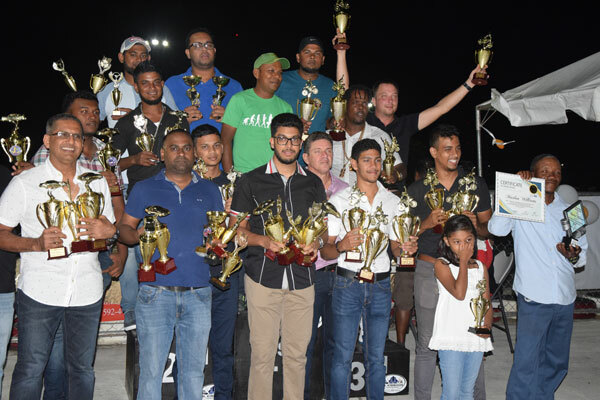 The top drivers from the first National Race of Champions, hosted by the Guyana Motor Racing and Sports Club (GMRSC) on Sunday last at the South Dakota Circuit, received their accolades on Monday night at the entity’s office on Woolford Avenue. A group of the top motor racers from Sunday’s National Race of Champions pose with their accolades on Monday Night at GMRSC’s office. The event served as a preliminary round to the Caribbean Motor Racing Championships (CMRC) which head of the GMRSC, Rameez Mohamed, indicated that he will be doing all in his power to have Team Guyana regain the title which they lost to current champions, Trinidad and Tobago. Mohamed Ahmad (Sports Tuner) and Matthew Vieira (Superbikes – Superstock) were the only daredevils that completed sweeps in their respective classes on Sunday, while reigning CMRC group four champion Andrew King won the first two races in his class before crashing out in the third which Mark Vieira won. Additionally on Monday night, the best performers at the curtailed ‘King of the Strip’ drag race meet last month also received their trophies, while the Club took the opportunity to honour the dedicated volunteers and marshals whose efforts helped make local motor racing a success.